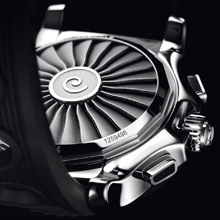 Meanwhile, the Skyracer is designed to be the most efficient selfwinding chronograph in its category. 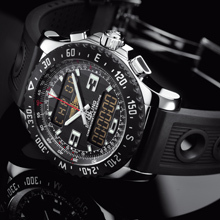 Bearing this in mind, Breitling has equipped it with Caliber 27, an exclusive mechanism enabling dual visualization of measured times. The 60-minute counter with central hand guarantees peerless readability of any measurement under one hour. For longer durations, a single two-hand counter shows both the hours and minutes. Elapsed time is read off just as one would read off the time, instantly and without any possible confusion. The rack-and-pinion mounted slide rule underscores the aviation-oriented vocation of both the Airwolf Raven and Skyracer Raven models. Movement: Breitling Caliber 78, SuperQuartz™ thermocompensated quartz electronic, officialy chronometer-certified by the COSC. Analog and 12/24 LCD digital display, display backlighting (NVG compatible). 1/100th of a second chronograph, alarm, countdown timer, 2nd timezone with independent alarm, battery end-of-life indicator. Digital perpetual calendar. Case: steel. Resistance to 5 bars. Bidirectional pinion bezel with compass scale, circular slide rule. Sapphire crystal, glareproofed on both sides. Diameter: 43.50 mm. Dials: Volcano black, Stratus silver, Tungsten gray. Straps: Ocean Racer or Diver Pro. Movement: Breitling Caliber 27, officially chronometer-certified by the COSC, selfwinding, high-frequency (28,800 vibrations per hour), 38 jewels. 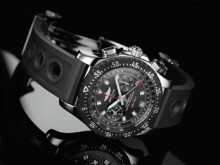 1/4th of a second chronograph, central 60-minute and combined 60-minute and 12-hour totalizers. Calendar. Case: steel. Water-resistant to 200 meters/20 bars (660 ft). Screw-locked crown. Bidirectional pinion bezel, circular slide rule. Sapphire crystal, glareproofed on both sides. Diameter: 43.50 mm. Dials: Volcano black, Stratus silver, Tungsten gray. Straps: Ocean Racer or Diver Pro.